As a personal injury lawyer, I have seen my fair share of car accident injuries related to lack of seat belt use. I had a case recently where a vehicle went off winding road in the hills of Los Angeles and one passenger as killed and another occupant seriously injured due to not wearing their seat belts. Safety restraints are vital to reducing these types of tragic cases. The National Highway Traffic Safety Administration estimates that use of personal safety restraints in vehicles it the number one most important thing any person can do to reduce the risk of serious bodily harm or death related to a car crash. In fact, in a study conducted in between 1994 and 2007, there was a direct correlation between auto collisions resulting in fatalities and lack of use of restraints. Moreover, the Centers for Disease Control has examined numerous sources and determined that the increased seat belt use since 1975 (when many states began to make seat belt use mandatory) has decreased the number of passenger and driver deaths in automobile crashes by hundreds of thousands of people. It is for this reason that all but one state (New Hampshire) now have seat belt laws on the books which require passenger and driver restraints for both front and rear seat occupants. The bottom line is that, based upon all reputable studies to date, restrained drivers and passengers sustain much fewer fatal incidents and catastrophic injuries than non-restrained persons. What Does California Law Require Related to Safety Restraints? California Vehicle Code section 27315 mandates that every driver and any passenger 16 years of age or older must use a lap and shoulder harness when driving or riding in a motor vehicle. Curiously, taxicabs, limo operators and emergency vehicles are only required to restrain children 8 year of age or older who occupy the front seat of the vehicle but, are required to “maintain safety restraints in good working order” for the use of the occupants. The statute also requires all vehicle sold in the State of California which were manufactured after September, 1989 to comply with federal regulations requiring the mandatory installation and inclusion of safety belts in the front and rear (See: 49 Code of Federal Regulation 549). Children under age 8 must be seated in the back of the vehicle in either a child safety device or a booster seat. If the child is 4’9” tall or taller, they may use a regular lap and shoulder seat belt so long as they sit in the rear of the vehicle. 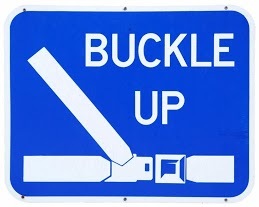 How Does The Lack of Seat Belt Use Affect A Claim For Personal Injury or Wrongful Death in CA? This means that lack of seat belt use does not establish, as a matter of law, that the person not using the safety restraints was negligent. However, California is a comparative negligence state. This means that claims for bodily injury and wrongful death in California may be reduced by the percentage of fault attributable to the person injured or killed. For example, if a judge or jury deems that plaintiff to be 30 percent at fault in an auto collision and the person who hit them to be 70 percent at fault, the award of money for medical expenses, lost earnings, and pain and suffering to the injured party or the family of the decedent will be reduced by 30 percent. Furthermore, if a parent or guardian fails to use child safety restraints in compliance with CA legal standards (set forth above), this can lead to serious implications for the recovery available to the child and/or for the civil liability of the parent or legal guardian. In some cases, it may also lead to criminal charges being filed for child endangerment under California Penal Code section 270, et.seq. As a personal injury lawyer that has represented hundreds of injured person and families of wrongful death victims, I would advise any person operating or riding in any passenger vehicle including a taxicab, limo, ride-share or their own personal car truck or SUV to wear a lap and shoulder harness whether in the front seat or back. I would also advise all persons transporting minors to assure that they are properly restrained and that if they are using child safety seats, they make sure the seat is a proper fit for the height and weight of the child. This saves lives and reduces the chances of serious injuries like fractures, internal bleeding, head trauma and other life-altering medical conditions. It will also increase the chances of being able to obtain a full and complete personal injury award from the at fault driver or vehicle owner. Embrace Life – Always Wear Your Seat Belt !